Billy Bass ventured to Casey Fields to see the Hawks absolutely smash the Demons. He took his DT notepad and put together this article for us! Thanks legend! This is the first time I’ve had a go at writing any sort of article so please bear that in mind as you read! My day started off poorly as the 25-minute drive turned into an hour, thanks to a crash on the freeway, roadworks and the footy traffic. This meant that I missed the first 6 or 7 minutes of the game. Both teams played a high possession, chip chip style of footy that lends itself nicely to us fantasy players. Both teams were prepared to switch multiple times across half back and the wings to create a loose man that could run and carry. It was a very windy day, making it difficult at times for the players. One thing that I must mention about Hawthorn is their versatility. Aside from a couple of defenders, all players rotated through multiple positions during the game, meaning that no one was out of the action for a long period. Mitchell (80) did as he pleased all day, both across half back and in the middle. Lock. He, along with Birchall, Hodge, Suckling, Burgoyne and potentially Rioli will all rotate across half back, meaning it will be impossible to predict who may get a forward tag from week to week. Birchall (59) in particular seemed to roam free and racked up plenty of possessions. Suckling (83)was almost unsighted in the first half but got going in the second. I was surprised to see him score so well, which is probably a good thing. 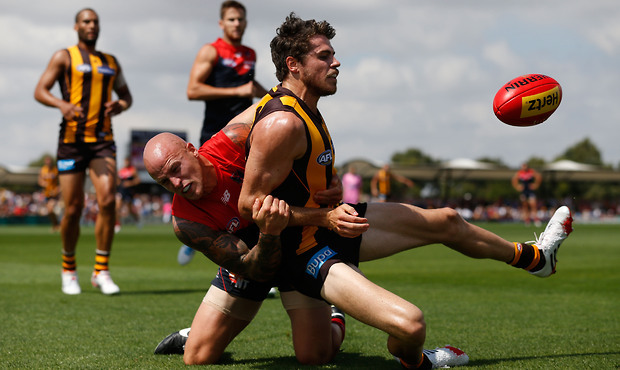 Hodge zoned off his opponents all day and picked up a lot of intercept possessions. He’s had a full preseason and could be a nice POD. Gunston (111) played the early part of the game as the main target in the forward line and was the beneficiary of some silver service from the midfielders. He also spent time on a wing, particularly in the last quarter and ran the game out well. It’s not out of the question for him to be a top 10 forward this year. 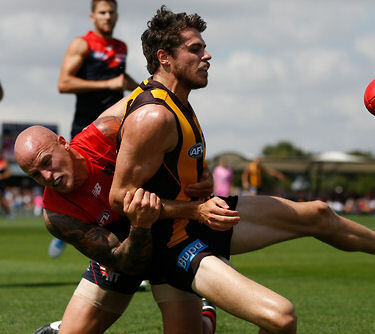 His partner in crime, Roughead (164), was everywhere as well. He played the same role as last year with stints as a ruck rover. He is a massive physical presence around the packs. Personally, I will be having one of these boys in my team this year, maybe both by the end of the season. Mcevoy and Hale rotated between ruck and full forward all day. I just can’t see Mcevoy (71) averaging over 90 this year, which is not what you want from your R1. There’s also the lingering shadow of the red vest that could come the way of either big man. Shiels (106) continued his dominant preseason, playing in the midfield all game. At times he looked to be following Vince, but it wasn’t a tight tag. If he plays this role and continues to find his own footy, which we know he can, then he will be an inspired pick. Langford (76) played a similar role to Shiels, rotating between mid and half forward, sticking close to Tyson around the packs. He has played 3 full preseason games and I think he is almost locked in for Round 1, meaning he should be locked into our teams. Wanganeen (57) and Heatherley (28) both played limited minutes. Heatherley will likely get a couple of games early due to Lake and Shoenmakers being out of the team, but he is a lock down full back and won’t score well at all. Don’t get sucked in if you see him named. Wanganeen is unlikely to play as Rioli and Burgoyne will both come back in for Round 1. On the Melbourne side of things, their scores will be quite deceiving due to the margin of the game. The first half was a pretty good contest; it was just that their kicking skills let them down time after time, meaning they couldn’t apply any scoreboard pressure. Jones (59), Vince (76), Tyson (64) and Michie (64) were the preferred centre square onballers, with very few stints forward. They were all given light duties in the last quarter, indicating their importance to Melbourne. Tyson and Michie are still locks and Vince might be worth looking at, although he will most likely be the main tagging target. Watts (59) played all over the ground, mainly as a wingman that drifted back to create a loose man. The closest thing he went near all day was his shadow! He is playing a very fantasy friendly role if you have the guts to go with him. Dunn (59) took the kickouts and zoned off his direct opponent, which I’m sure every opposition coach would be happy to see, as he butchered nearly every possession he had. He is more of a risk than Watts, maybe worth a look in draft leagues. I believe he may actually be keeping Georgiou (19) out of the team come Round 1. We will have to wait and see with that. Toumpas (40) started like a house on fire and then was barely sighted after quarter time. Grimes (53) played as a lock down defender on Breust, indicating that he doesn’t seem to have a lot of fantasy value. Howe was the main forward target and looked lively when the ball was in his area. That will change when Clark, Dawes and Hogan are fit. Jay Kennedy-Harris (24) only played the second half and barely touched it, mainly because the ball didn’t make it forward of centre. His scores will fluctuate with Melbourne’s performances and he would only be a F7/8. He also played the VFL game straight after, assuming for some more game time. Georgiou only played the second half as well. He had Gibson in the last quarter, who kicked 2 goals on him in 10 minutes. As I said earlier, I’m not convinced of his spot come Round 1 and he also needs to be elevated from the rookie list. Hopefully he plays and we can stash him at D8. I was unable to confirm whether he suited up for the VFL game. There were a number of players who were named and either didn’t play or played very little minutes – Sewell, Ceglar, Litherland, Wanganeen, Hallahan, Woodward and Viney. Most played the VFL game that followed, but it looks unlikely that any of them are in their teams Round 1 plans. There you have it. I must say it was strange watching a game of footy without listening to the radio or having the opportunity to check stats. All of my thoughts are exactly that, and I chatted to supporters to gauge their opinions as well. If you have any questions then chuck them in the comments and I’ll do my best to answer them for you. Follow me on twitter @byronrick, I’ll share my fantasy thoughts there as well throughout the year. What a way to start your DT Talk career! Great article mate. McEvoy comment is interesting, did he spend 50/50 with Hale in the ruck? Thanks mate! The split would have been about 60/40 but when he rests forward he’s alongside Roughy and Gunston. The past few years we haven’t relied on a dominant ruckman so it is a bit of a hunch as to his scoring levels. When u say u were surprised to see Suckling score what did he actually finish on? The reason I ask is im tossing up between Swallow, Suckling and yes even Jack Watts, not sure what direction I want to go as yet and its getting closer and closer to the beginning of a great season. Any help? If you can try to fit in both Swallow & Suckling, that’s what I’m doing. He finished with 83, apart from a trademark 55m goal I didn’t really notice him. His kicking is ridiculously good and he is obviously a preferred distributor across half back so he will play an important role this year. I don’t think he will get tagged with Hodge, Birchall and Mitchell more likely so he’s a safe bet, especially at his price. I personally think he’s the safest out of the 3 you mentioned. Very nice maiden article! Really informative about the position which is really all you can talk about in these practice matches. Still really undecided about Shiels. Not starting him in round 1 but if he goes bang I might have to include him in my team. What do you think? Thanks! Shiels is a tricky one. He has shown his scoring potential back in 2011 and if he is left to get his own footy then he could post similar numbers. The great unknown is if he will be asked to tag. You don’t want a midfield player knocking out 60s when you have picked him to score 90+. If he doesn’t tag then I’d be looking to get him in early, even at the expense of Daisy Thomas. I’m surprised no one is talking about Nathan jones. maybe won’t sustain it through the season but I think he can average 100+ for first few games. Great write up. Just wondering where you pulled all your stats? Or was it just off twitter? I had no access to stats, Warnie has added them in himself. I couldn’t find them anywhere, hopefully he can tell us where he got them from. Cheers Rick, great first up effort! Brilliant first up article mate! Hawthorn’s forwards are racking up big scores early, Jack Gunston looks pretty promising but im not conviced, i like the look of buddy they are play GWS round 1 and could be a kick start to a high flying year ahead. Meanwhile is there going to be an article for the north v cats game pretty good scores out of it. Some stats from the game on the north melbourne website. Jack Ziebell is one to consider having another great game with 25 disposals and several tackles! Thanks for taking the time to do this write up for us Rick. And a good effort for your first article. Great write up, well done! I’ve been convinced that Shiels is a bit of fools gold, given he’s been used in a run-with role for quite some time. But a few tweaks to the Hawks set up, plus the likely addition of Langford, makes me think he may be the real deal. I CAN fit him in if I upgrade one of the mid rookies (C.Beams most likely), but it’s a risk – how did it look at the game, has Clarko decided he’s earned his stripes and handed the tagger job to Langford full time? The last part of your post is the million dollar question. It’s hard to give a definitive answer on his role, hopefully someone asks Clarkson in his press conference this week! Langford seems to be locked in as the main tagger, who knows if Shiels will tag as well. does anybody know what round the price changes occur? After round 2 this yr mate. So is mcevoy still worth getting or should we be looking at someone else for the ruck? also i’d be VERY surprised to see Wanganeen dropped for Rioli in rd1, given that he’s suspended – but will it see Shiels drop back to the tagging role? Best Ruck option under 465k?? Currently have McEvoy but dodg pre-season form and the thread of Hale taking some points off him has turned me off. Leuenberger, Ryder, Mumford, Nic Nat or Lobbe?